This is certainly a strong chapter, don't you agree? In this chapter, Saying Hello to Please God, the author challenges us to see if we are not acting like Eli, "this sad figure in Israel's history [who] is the quintessential example of a father who chose to please his sons rather than God and lost everything he cherished as a result." We are like Eli when we hear that our children are not being faithful to the Covenant, when they are not walking in the Lord and we pretend we are dealing with the matter using words, an infinite number of words that sound hollow in our children's ears. We are like Eli when we refuse to do what we know God wants us to do, but instead we only keep up having conversations with our children -while fooling ourselves knowing that the reality is that they are not listening to us. "Eli was fully aware of his sons' actions, and he knew that they were not only in the wrong but in danger of the Lord's judgment. He certainly nagged them and criticized them, but he did not restrain them and ultimately both he and his sons paid the price." How many times we, parents in the church, have not done everything in our hands to restrain our children from doing evil? May the Lord have mercy on us! Moms, if you are reading this and have younger children, don't fall into this trap. The world is telling you that the best thing you can do to make your little one come to her senses is not the rod, but a good conversation. Beware of this philosophy; if you start following this pattern of not doing the hard, biblical thing, of not doing something beyond a good talk with your daughter to restrain her from sin, you won't be able to find a way out of this terrifying maze when she grows up. Remember, the sin of not restraining our children often starts when they are young. And as always, there is a heart issue behind our actions -or behind our lack of obedience-. In the text we read that Eli honored his sons more than he honored God. "Eli's sin was that he treated his sons as more weighty or important than the Lord. He was so concerned with maintaining the peace that he didn't have the courage to do what the Lord required him to do." The authors give us some good examples on page sixty-one in which we can clearly see when parents are nagging their children and not seeing changes: the sluggard child, the one who parties every Friday, the girl sleeping at her boyfriend's house, the one who abuses their parents' provision, the child who gets drunk over and over again and brags about it on Facebook, the one who is disrespectful, the one who is unloving, the one who shouts and wants things done her way. But we can also think of lesser examples that if are not dealt with, will only lead to our children's destruction. Oh, that the Lord will give us a humble heart that recognizes and admits these struggles. That He will give us grace and courage to deal with the most difficult issues and stop pretending that things are really not that bad. We know that in this life there is no neutrality. We are either building or destroying. We are either enabling sin in our children's lives or we are restraining it. Sisters, we have a God full of grace who not only gives us grace to endure the hard providences in our lives, but One who also gives us grace to obey Him in the most difficult things. His Grace is sufficient. God can give us the grace to open our eyes and see what we have been trying not to see all along because "we feel entrapped by our love and hope for them." The questions are real, "What would happen to them if we told them to choose between right and wrong? What if they chose wrong?" 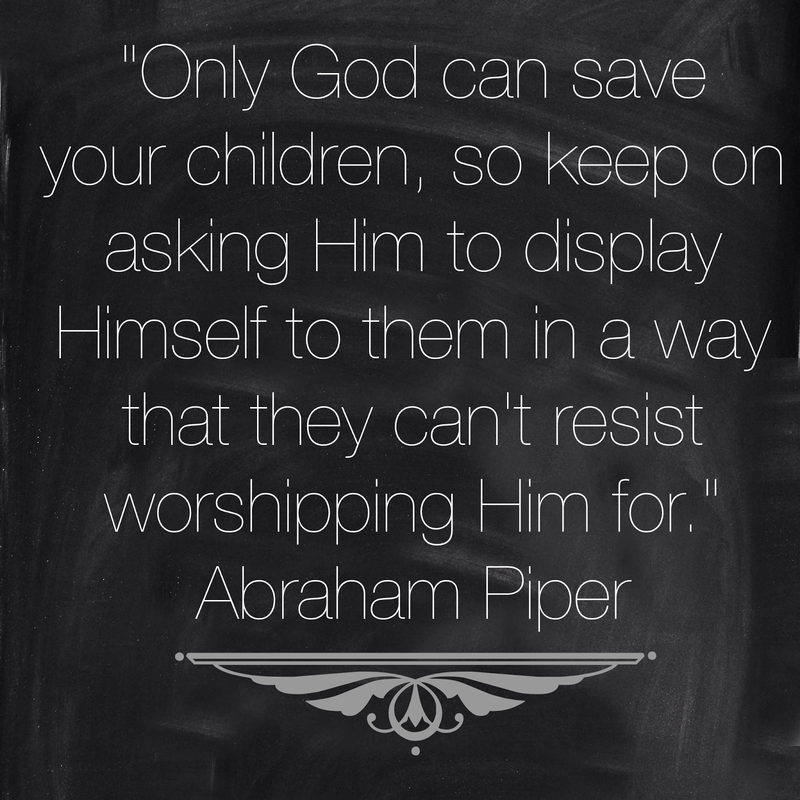 But there is no way around, the only way to keep our hope for our children anchored in Christ is to obey our Lord. And, oh what a great and unshakable hope we can have in Christ! In our Savior! To know that He hears our prayers, to know that His promises are truth, to know that His desire is to save families! What a blessed hope! "Parents don't always have to actively chastise their irresponsible children. Often the best thing for us to do is nothing. Sometimes love looks like taking a step back and allowing them to experience the fruit of their choices (Galatians 6:7)... If we continually step in to "protect" our children from the consequences of their wrong choices, we may be guilty of honoring our children above the Lord by standing between them and the chastisement the Lord is bringing upon them... Remember that the Prodigal son only came to his senses when his circumstances were so bad that he longed to eat pig food." And I am reminded again of this powerful article in which Abraham Piper and his father John write about the time in which Abraham was excommunicated from his church. It is certainly a powerful testimony of a father who honored God more than his own son and the way God answered his prayers. It is a story that will build up your faith and renew your hope. It is a story like the ones that God loves to write. This is something that I understand should be dealt with as a couple. I encourage you to talk to your husband about your concerns, read this chapter with him and answer the questions on p.68 together, seek the counsel of wise men in your church, and mostly don't lose hope.